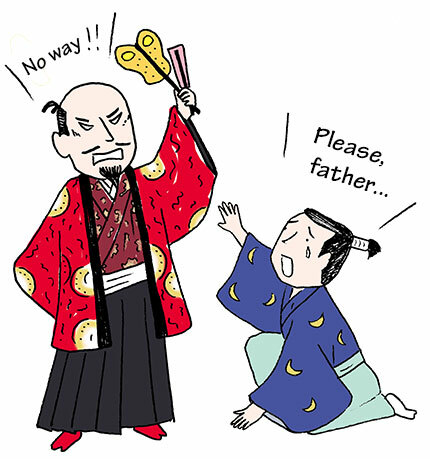 TRIVIA of Noh : Q152 : Did samurai “Noh fanatics” sometimes go too far? | Home | Trivia | Q152 : Did samurai “Noh fanatics” sometimes go too far? Did samurai “Noh fanatics” sometimes go too far? Noh was an activity for samurai, like golf for business people in the present day. From the Sengoku era through to the Edo period, many samurai learned Noh performance either for social reasons or for pure pleasure. Some later became known as “Noh fanatics” because of their excessive absorption in the art. Yagyū Munenori, a swordplay instructor for the Tokugawa family, was one such fanatic. He was close to Konparu Shichirō Ujikatsu, a Noh performer also based in Yamato (currently Nara Pref. ), and they exchanged lessons in Noh and swordplay. Munenori’s devotion to the art was deep. A priest who was his friend, Takuwan Oshō, related in his book “Fudōchi shinmyōroku” (The Unfettered Mind) that the priest had to warn Munenori to stop visiting feudal lords and forcing them to watch him perform, as this had become almost an obsession for him. The story would later undermine Munenori’s image as an stern master of swordsmanship. Other examples of Noh fanatics in the same era include the first son of Oda Nobunaga, Nobutada, who became so deeply involved in the art that his father deprived him of his Noh paraphernalia. Meanwhile, warlord Toyotomi Hideyoshi was famous for his overindulgence in Noh and even created an original play to celebrate his own military exploits (See Trivia Q104).